Intrigue, backstabbing, secret messages and double agents: Reading the world's largest game publisher's counter-suit against the top people in charge of creating one of the biggest video game franchise in history is like dropping into one of their Modern Warfare video games. Told from the perspective of Activision, the publisher didn't take lightly the firing of Jason West and Vince Zampella. It was, they write in the 23-page lawsuit made public today, a decision that did not arrive at lightly or without good reason. Reached for comment this afternoon, Robert M. Schwartz, the attorney representing Jason West and Vince Zampella, called Activision's take on the increasingly volatile break-up of the game makers and game publishers "false and outrageous." "Activision's inaccurate and misguided allegations lose sight of the reality here: None of the false claims of insubordination or breach of duties had any negative affect on Activision — none," Schwartz told Kotaku. "Modern Warfare 2 has been the world's most successful video game. And none of this changes the fact that Jason and Vince would still be at Infinity Ward developing new games except that Activision kicked them out. This is just an Activision tactic to avoid paying Jason and Vince and everyone else at Infinity Ward the millions of dollars they all earned and that Activision owes them. Since being fired by Activision, Jason and Vince have taken steps to regain control over their creative future and plan to have an announcement very soon." But, according to Activision's counter suit, the birth of Call of Duty was the happy child of a happy relationship. New studio Infinity Ward was in dire financial straights when they came to Activision looking for help. The publisher says initially they purchased 30 percent of the developer's stock and then in 2003 bought up the rest of the company. With it came West and Zampella, both of which were eventually signed on with contracts through 2011 that prevented them from hiring away employees if and when they left for three years. Over the course of their employment, Activision claims, the two became increasingly hard to deal with. Both are said to have refused to cooperate with Activision's business plan calling for a "unified approach to the Call of Duty franchise" and most recently threatened to halt Modern Warfare 2 production several times. Activision also writes in the suit that the two began to become increasingly insubordinate, telling other employees that Activision executives were incompetent and even "openly discussed divorcing Activision" to create their own studio. Around the same time, Activision claims, the two begin to undermine their current employees jobs making them unhappy and easier to pull away when they left. One example Activision gives is a claim that West and Zampella begin to take an "inordinately large share of the bonus pools" from the Modern Warfare games for themselves. The two took one-third of the total bonus pool for the Call of Duty franchise bonuses, which included the first Modern Warfare game, for example. West and Zampella were demanding an even larger share of the bonus pool for Modern Warfare 2, Activision says. That's something Activision says they plan to rectify if they win the suit. At some point, the two sought the help of a talent agent to "secretly contact the CEO and other senior executives of Activision's largest competitor." While not named, that is mostly likely California-based Electronic Arts. EA has not yet responded to for request for comment. The two did their best to hide the communications, according to Activision, but the publisher found out and even included sample emails in the suit. "West and Zampella sent and received the following messages in an apparent effort to covertly copy certain materials, reading in part: "Dunno how to scan secretely 13 [sic]. . . . [IW Employee's] computer down. . . . [IW Employee] did it for me last time. .. .Really. No paranoia about it being in [IW employee] user folder? Her comp down anyway now. . . She had a secret area it scanned into. . . . Probably better to just photocopy and fedex. .. .Can scan or photo - your call. . . . Boom boom pow. Away." Activision's suit seeks an unspecified amount of damages and asks the court to prevent West and Zampella from trying to hire away Activision employees, using any information from Activision for making games and wants the two to return their bonuses. "The allegations Activision made today are false and outrageous," Schwartz said. "Just one example is Activision's allegation that Jason and Vince conspired to spin off Infinity Ward. 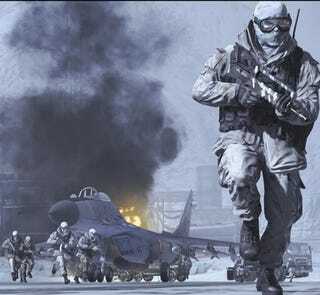 Activision itself proposed spinning off Infinity Ward when, last year, it sought to renegotiate Jason and Vince's contract and induce them to forego developing a new game in favor of doing another Modern Warfare sequel. Jason and Vince had hired the Creative Artists Agency to advise them in their negotiations with Activision, and not to breach their contract. The conversations with IW employees, talent agents, and others during these negotiations with Activision were not conducted in disrespect of Activision but to see if Activision's proposal could work." West and Zampella for their part, claimed in a lawsuit filed against the publisher after their termination that Activision carried out an "Orwellian," "pre-ordained" investigation designed to "manufacture a basis to fire" them in order to avoid paying them bonuses. The ex-Infinity Ward leads also claim that Activision "conducted the investigation in a manner designed to maximize the inconvenience and anxiety it would cause West and Zampella," harassed them and other Infinity Ward employees and refused to honor contractual agreements. The two Infinity Ward founders are seeking "in excess of $36 million" in damages from Activision as well as rights to the Modern Warfare brand of games. Specifically, that meant "any Call of Duty game set in the post-Vietnam era, the near future or the distant future." Stephen Totilo, Michael McWhertor and Michael Fahey contributed to this report.